"Sampath Speaking" - the thoughts of an Insurer from Thiruvallikkeni: Judging players by Yo-Yo test ~ is fitness important or talent !! Judging players by Yo-Yo test ~ is fitness important or talent !! Don’t blame the rain God ! blame the Selectors ~ it is monsoon time and it has been raining daily in these parts ! 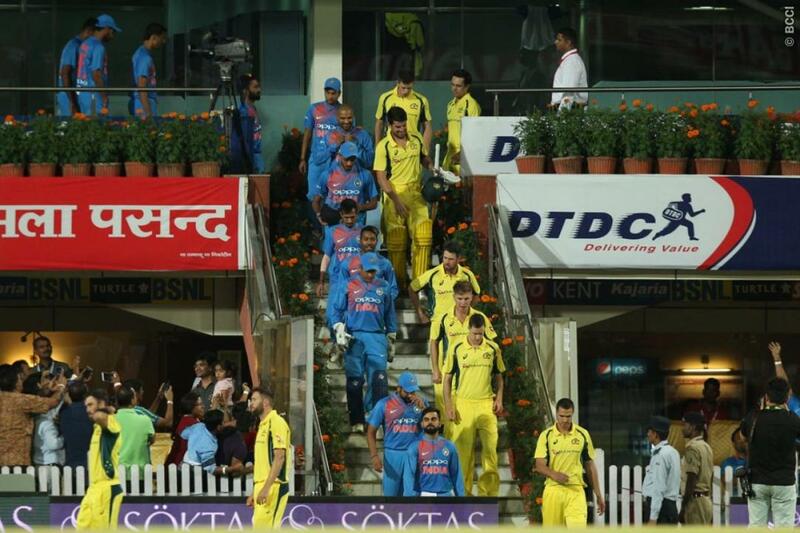 - The deciding T20I between Australia and India in Hyderabad was abandoned as a result of a wet outfield. Over two weeks of heavy rain leading up to the match meant the ground had taken in a lot of water. And even though there was at least two hours of clear weather before the first ball was due, the ground could not be gotten ready. For the fans, selecting him and not picking him in playing X1 was a cruel joke on 38 year old left arm seamer Ashish Nehra who stunned cricket fans with his decision to retire from international cricket after the game against New Zealand at the Ferozeshah Kotla in the Capital on November 1, many asked him to play a few more seasons of the cash-rich Indian Premier League. The senior pro has made it clear that he trained to play for the country and not IPL. He last played a Test in Apr 2004; One dayer in Mar 2011 and T20 in Feb 2017 !! I vividly remember this guy who made his debut against England in Dec 1984 – the bowling lineup missing Kapil Dev read, Chetan Sharma, Manoj Prabhakar, Ravi Shastri, Roger Binny and Rajinder Sing Ghai. Alongside Ghai, Kiran More, R Robinson and Richard Ellison also made their debuts. Rajinder Singh Ghai was one of several new ball bowlers tried out to supplement the seam attack in the mid eighties when the one day game became fashionable in India following the World Cup triumph. After the not so good initial match against Andhra in Ranji, comes the news that – ace off-spinner Ravichandran Ashwin, who is out of the side for the ongoing Australia series, headed to Bengaluru for the Yo-Yo test ! The off-spinner wrote on his Twitter feed that he had got through the test, which is now a must to play for India. " Ashwin had said earlier that he was ready for the Yo-Yo test. "I am a man for systems and any system put in place, I would strive my level best to try and match up to it. Every leader has his own vision of how to bring the team about. This is the vision of the current leadership group and it's important to respect it," Ashwin had said. Sometime back, Sri Lanka Cricket (SLC) suspended Danushka Gunathilaka for six white-ball matches for misconduct. This is why the opening batsman was omitted from Sri Lanka's squad for the ODI series against Pakistan in the UAE. He was also fined. ESPNcricinfo reported that Gunathilaka missed a training session, turned up to a match without his gear, and was generally found to have had an indifferent attitude towards training - all during Sri Lanka's recent home series against India. One other player had also been pulled up about his off-field behaviour, but has received only a warning, as unlike Gunathilaka, SLC believed he had displayed full commitment to training and matches. Australians and South Africans are supremely fit ~ the same cannot be said of Asian teams Pak, India, Bangladesh and Srilanka – we have had Inzie, Vengsarkar, Arjuna Ranatunga, Rohit and more ~ oozing with natural talent… is the outlook changing !! Every cricketer — not just those who play the energy intensive shorter versions, but even Test cricketers — will now need to have a basic level of aerobic endurance prescribed by the Indian team management. According to BCCI CEO Rahul Johri, even if a cricketer happens to be injury-free and in form, failure to meet the mandatory fitness parameters would result in him making way for a fitter player. “The captain, coach and chief selector, along with the other members of the selection committee in consultation with the support staff (trainer and physio), have set the parameters. The fitness parameters set by the team management for athletes to be eligible for selection are non-negotiable,” Johri told The Indian Express. He said that the present set of players — who were part of India’s limited overs series against Sri Lanka and those involved in the ongoing home series against Australia — had all cleared the first of the management-approved parameters: the yo-yo test, the globally-recognised cardio drill for international athletes. It is the dreaded test ‘Yo-Yo’ that tests the players capabilities and not their talents – the test requires players to pace themselves methodically — starting with a modest jog to the eventual gut-busting sprint — as they shuttle back and forth between two rows of cones kept 20 metres apart. Each run needs to be timed with the three beeps that are played in the background. These are the signals for start, turn and finish. With the timing between the beeps constantly decreasing, each subsequent 40m circuit requires more speed. Getting beaten twice by the beep means the end of the test. The final score is determined by the laps completed and the speed gathered. A former member of the Indian coaching staff said the team management should keep in mind that aerobic endurance can’t be the only criterion for selection. “The yo-yo test can’t be the only criterion to test a cricketer’s fitness. It’s a skill-based sport. There’s so much mental stamina that’s required too,” he said, adding that many of the past legends would have failed the test. True can one imagine putting the likes of Erapalli Prasanna, Bishan Bedi, Gundappa Viswanath, Vengsarkar, Ashok Malhotra and more going through this – is it not he talent that is material ? A web search reveals that in general, there are two different versions of the Yo-Yo tests (the intermittent endurance (YYIET) and the intermittent recovery test (YYIRT)), each having two different levels (level 1 and 2). As a result there are a total of four different tests. Media reports suggested that veteran cricketer, Yuvraj Singh and left-handed batsman, Suresh Raina were left out of the Indian ODI squad for the Sri Lanka tour due to a failed yo-yo test ! though there were some denials too.. .. So is fitness the ultimate key – a player may make runs a plenty or take bagful of wickets but if he fails the Yo-Yo fitness test, will he not be picked in the Indian team. In that sense, would not Yo-Yo change the dynamics of selection, alter the manner the player’s capabilities are judged. Is it fitness or talent which is most important ? The BCCI has set 16.1 as the benchmark score to clear Yo-Yo. Soon, we could have the bar raised to 17.5. In countries such as Australia, the mark is around 20. It is not only Suresh Raina and Yuvraj who fell by the way side. Reports suggest that promising off-spinning all-rounder M.S. Washington Sundar was all but selected in the Indian team for the three-match Twenty20 series against Australia before falling to Yo-Yo. He scored 15.7 in the test conducted at NCA; he is still not 18 years of age! "His idea of a fitness program was a bit of pig shooting, a bit of fishing. Running around the oval wasn't one of his high priorities. But he was happy to bowl all day" Greg Chappen once wrote on legendary pacer Jeff Thomson. Ashish Nehra’s inclusion in the Indian squad for the tree-match Twenty20 series against Australia may have surprised many, mainly because of his age. A 38-year-old fast bowler in T20 Internationals is seldom heard of. But his friend and former teammate Virender Sehwag revealed, on-field fitness is not a concern for the veteran, in fact his score on the “yo-yo” endurance test is on par with that of Virat Kohli, arguably one of the fittest cricketers in the world. A couple of decades ago, was present at Chepauk stadium eagerly watching the Indian Cricketers train .. .. Dilip Vengsarkar came out did a little bit of stretch near the pavilion barriers and was standing with hands on hips [he perhaps had the easiest of stance at crease and made runs with elan]; Sunil Gavaskar walked around talking to people and practicing mock drives; spinners were rotating their arms – Kapil Dev captured attraction with his exercise drills, then went running around the ground as hundreds of us cheered him as he got closer – alongside Rajinder Singh Ghai ran so easily and tirelessly for 6 or 7 rounds of the stadium – we all spoke about his attitude and stamina – he was to play in only 6 one dayers making a solitary run and 3 wickets in all. Judge the players by their talent and how they have performed against International teams ~ not merely by how fit they are ! !